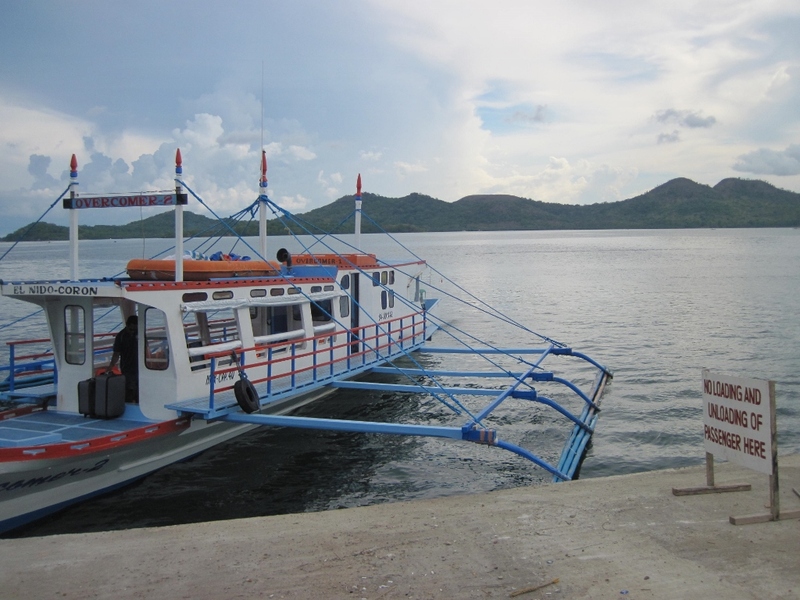 After a turbulent flight from Cebu to Puerto Princesa, we made our way from the airport to the bus terminal where we boarded a bus to El Nido. What was supposed to be a six hour journey took seven and a half hours so it was getting dark by the time we reached El Nido. We settled into some cheap digs outside of town and moved to an ocean front guesthouse on the main beach the next morning. 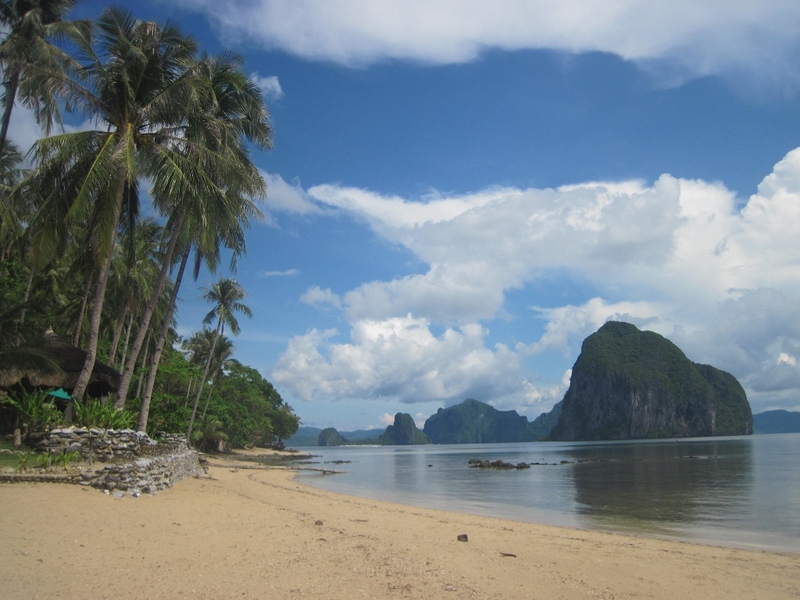 El Nido is on the northern tip of the island of Palawan and is known for its beautiful karst limestone scenery. 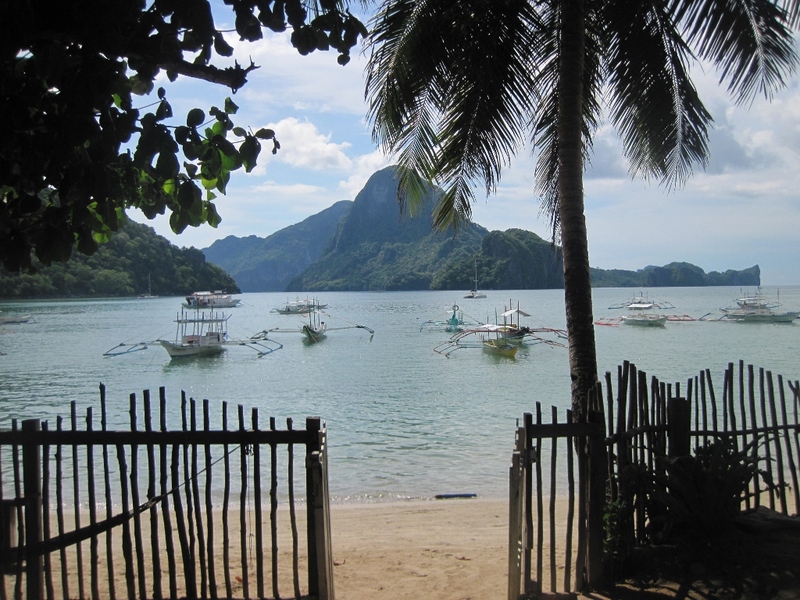 The views are great but the main beach is full of boats and isn’t the greatest for swimming. 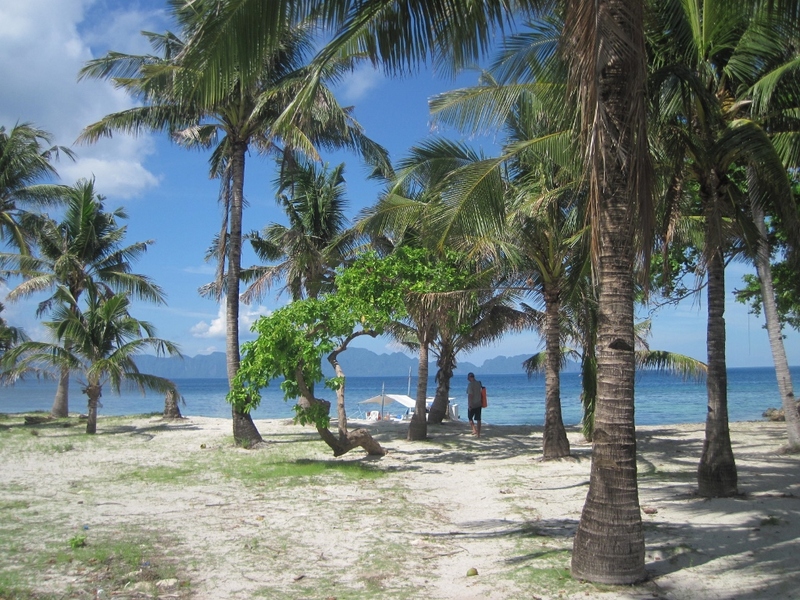 We had previously talked to other travelers who recommended nearby Las Cabanas Beach so we hired a tricycle to take us there for the day. The beach was stunning with only a handful of other people around. 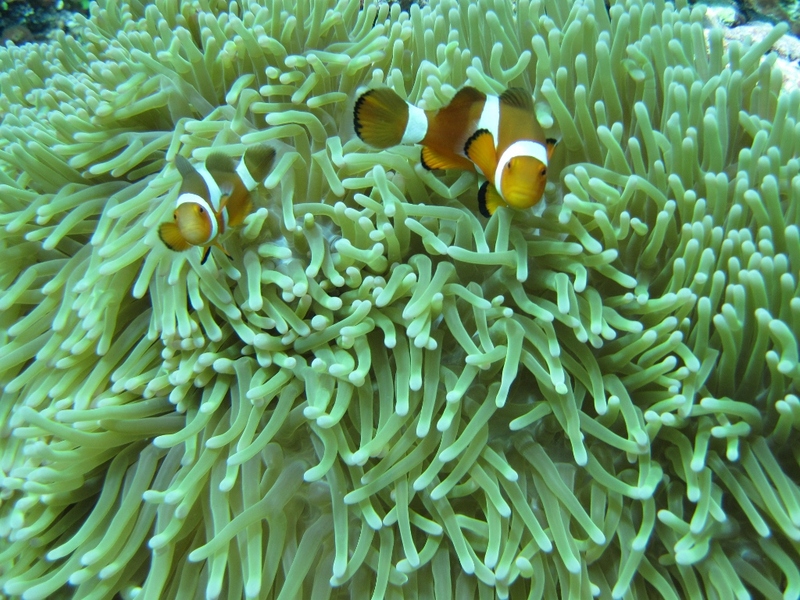 That evening, we ran into a Polish couple we met diving on Apo Island. 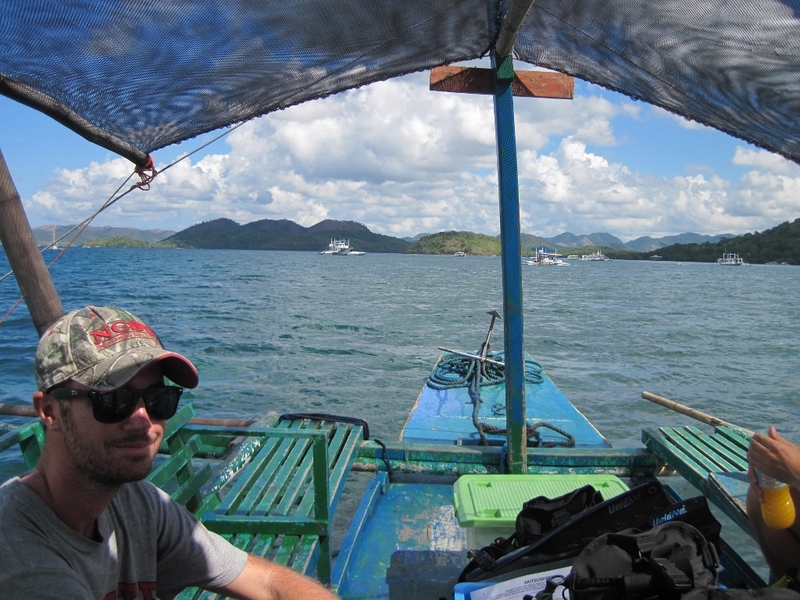 They were with a group of people organizing a boat for an island hopping trip the next day so we decided to join them. The boat stopped at five different islands and our first stop was more than an hour away giving us time to snap some photos of the gorgeous scenery along the way. 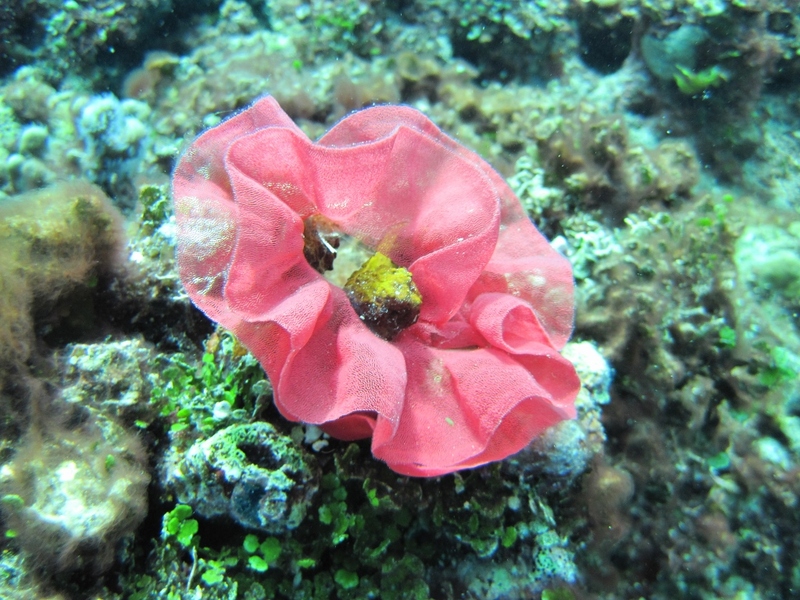 Each of the five islands offered something a little different but almost all of the islands offered decent snorkeling. 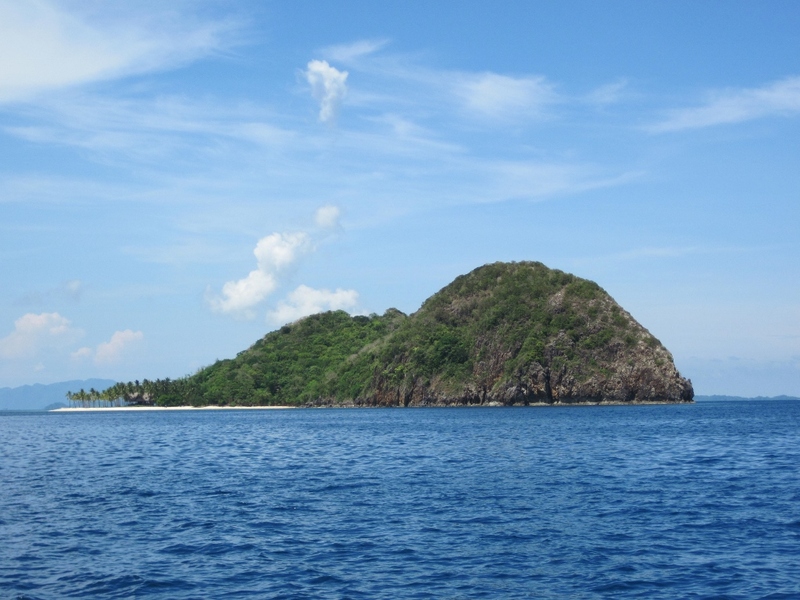 One island was called Secret Beach because you had to swim through a small opening in the rocks. 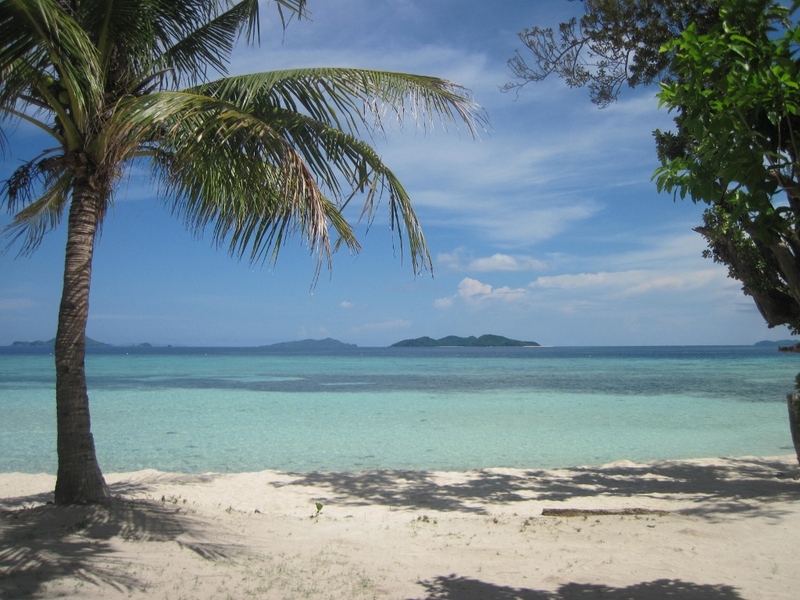 We stopped at another island for lunch which had a scenic lookout to view the surrounding area. 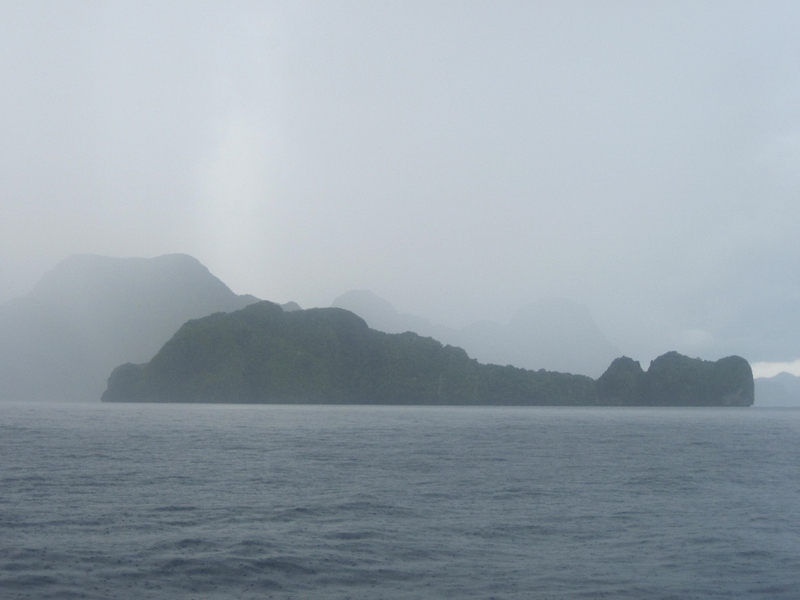 Hidden Beach was completely camouflaged by its surrounding rock formations and we got caught in a pretty good thunderstorm which added to the adventure. Luckily it was short lived so it wasn’t long until we were back in business visiting Helicopter Island, named for its shape, for some more swimming and snorkeling. 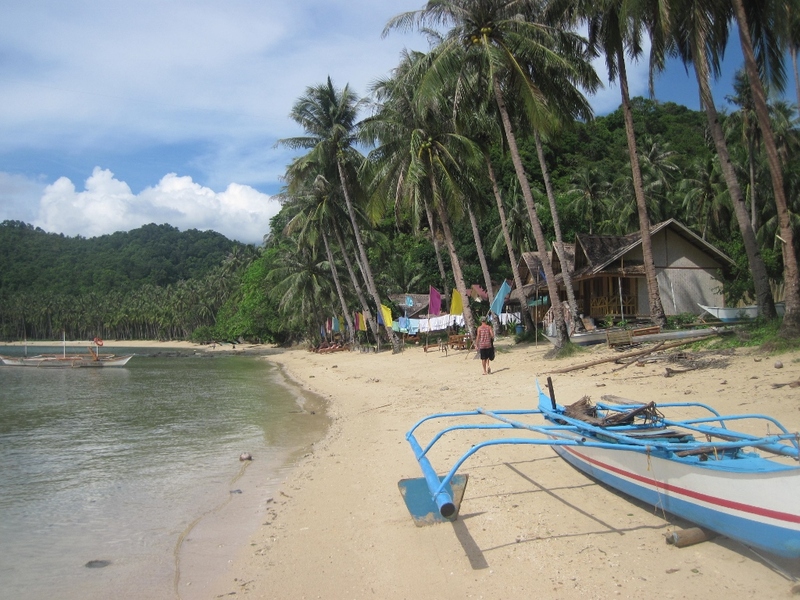 The island hopping tour was nearly eight hours and quite exhausting so we decided to go back to Las Cabanas Beach the next day. It was even prettier the second time around. 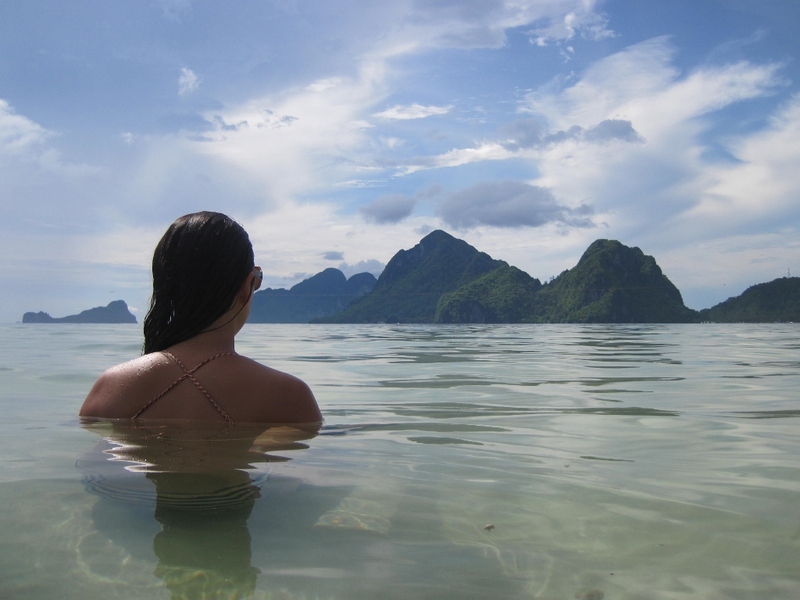 By our fifth day in El Nido, it was time to move on. 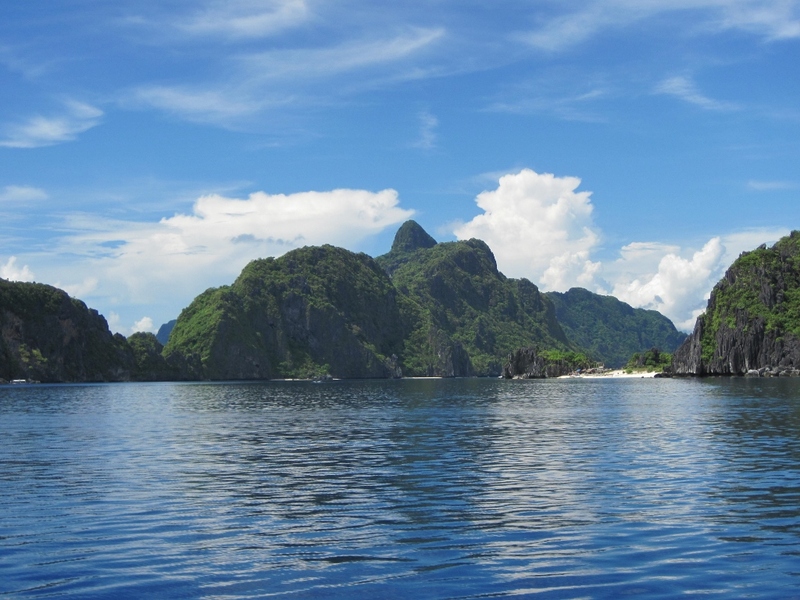 Turns out the Polish couple, Patricia and Robert, were headed the same way so we negotiated four tickets on one of the daily ferries from El Nido to Coron. 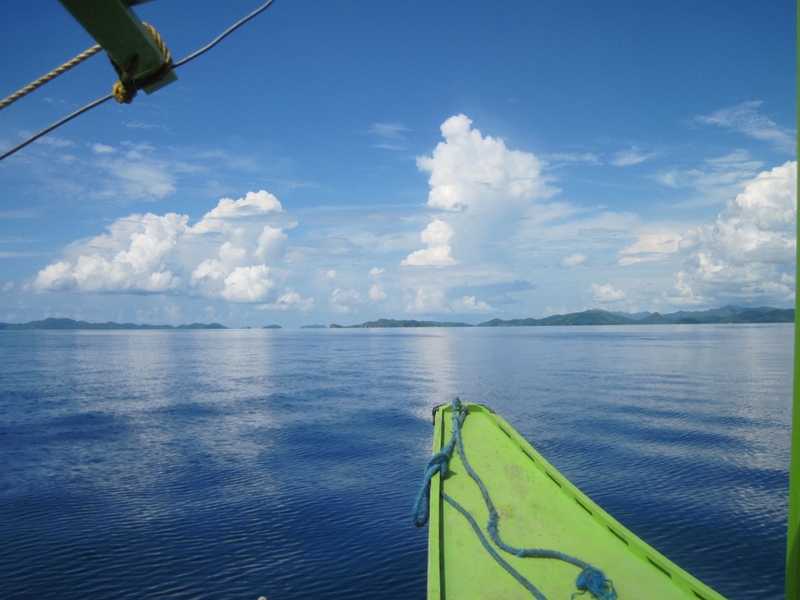 We were dreading the seven hour ride in such a small boat but it turned out to be pretty relaxing and incredibly scenic as we passed island after island and beach after beach. 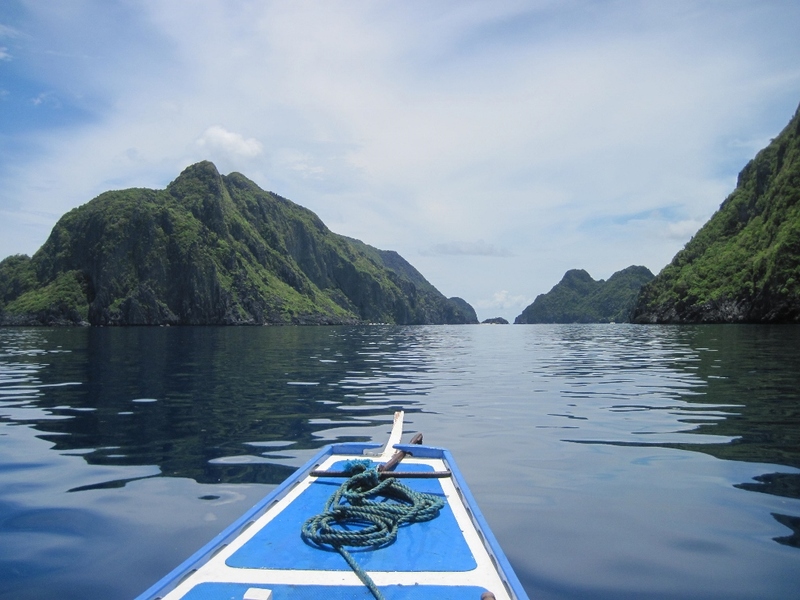 I think the boat ride really put into perspective just how many islands comprise the Philippines and most of them are untouched and uninhabited. 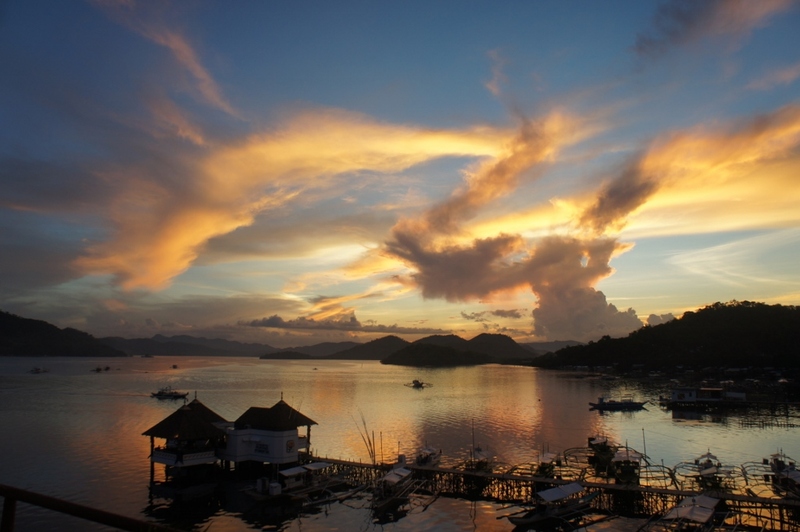 It was early evening when we finally arrived in Coron. 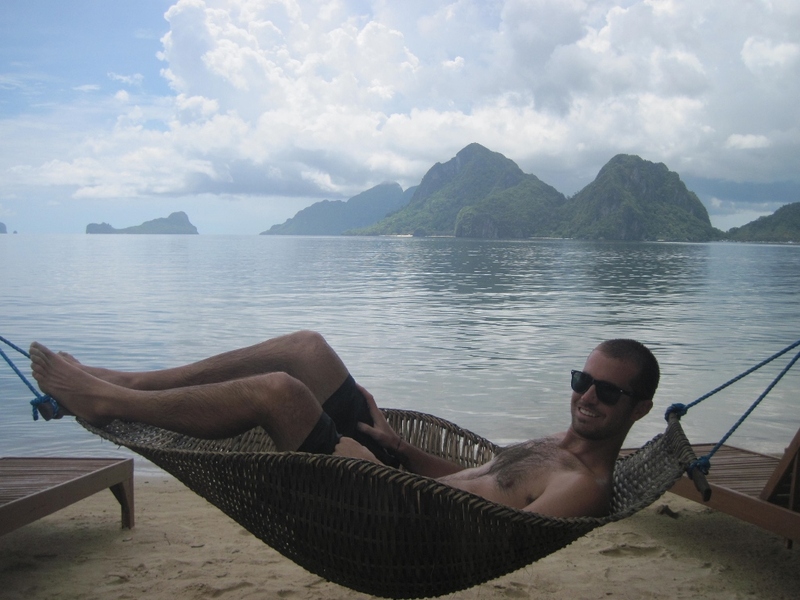 We found a pretty sweet guesthouse and then went to work talking to the numerous dive shops in town. 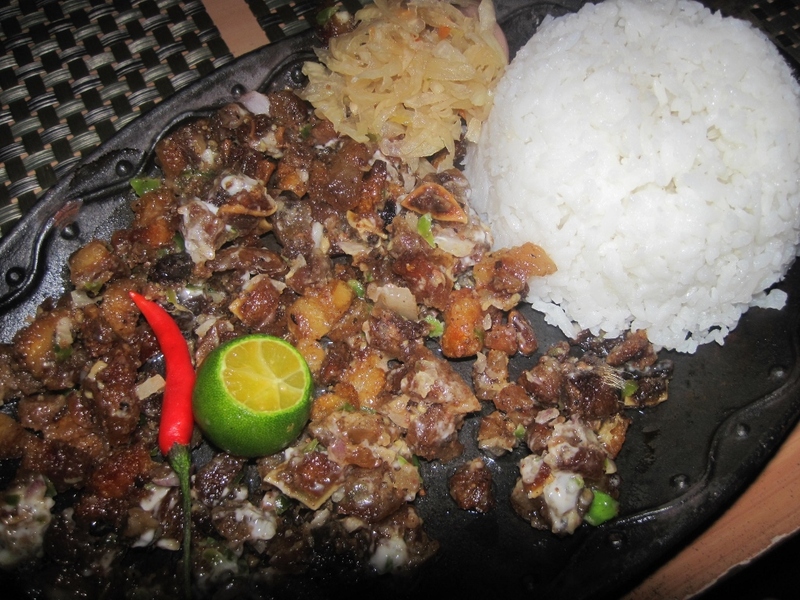 We signed up for two dives for the next day and then found a local restaurant for dinner where Chris feasted on a plate of sizzling ‘sisig’ or pig face. It’s a bit fatty but pretty tasty! 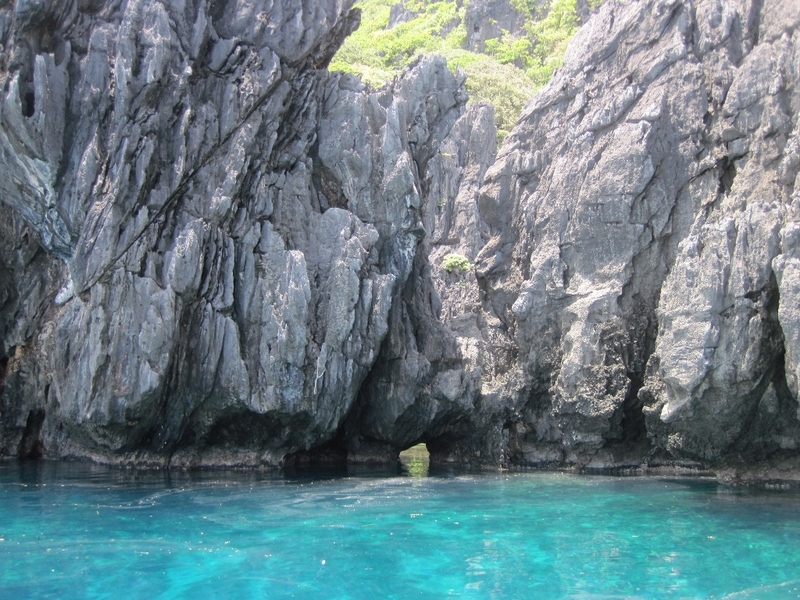 Coron is known as the “Shipwreck Capital of the Philippines” because of its vicinity to about a dozen sunken Japanese war ships from WWII. Our dive boat took us about an hour offshore for two different wrecks. Olympia Maru and East Tangat were both Japanese auxiliary cargo ships sunk by U.S. air raids on September 24, 1944. Olympia Maru (our favorite of the two dives) sits 80 feet below the surface of the ocean while East Tangat rests at 60 feet below the surface. Between the two dives, we were able to swim through a propeller room, boiler room, kitchen and several cargo holds (one of which held stockpiles of explosives). The visibility was pretty bad ,which is normal for the area, but it just added to the spookiness of the experience. 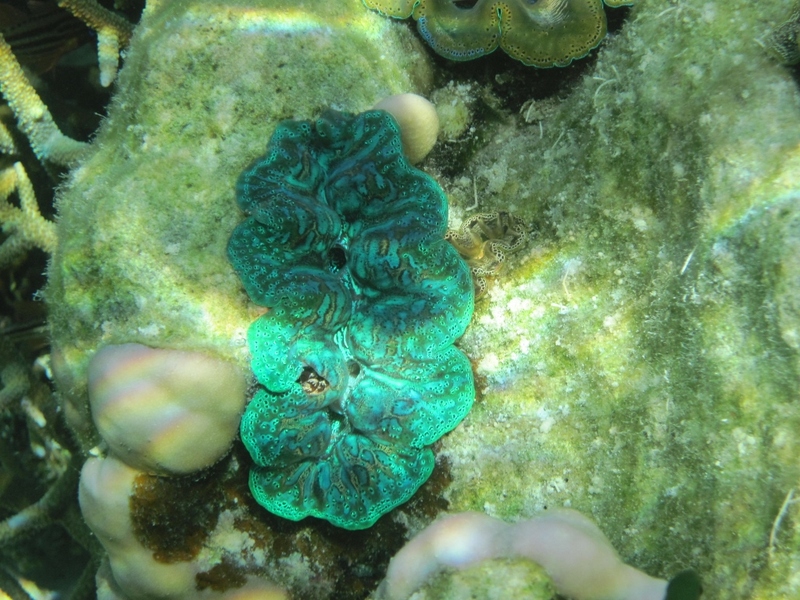 It was surreal seeing evidence of former life on the sunken ships…valves and ladders were overgrown with coral and reef life…definitely an awesome experience! 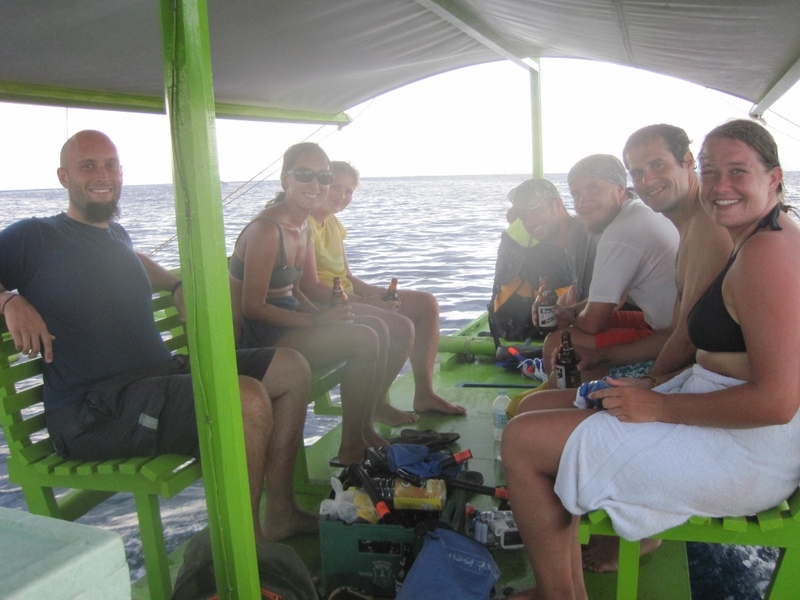 Between our two dives, we ate lunch and our dive leader showed us the local dive equipment. 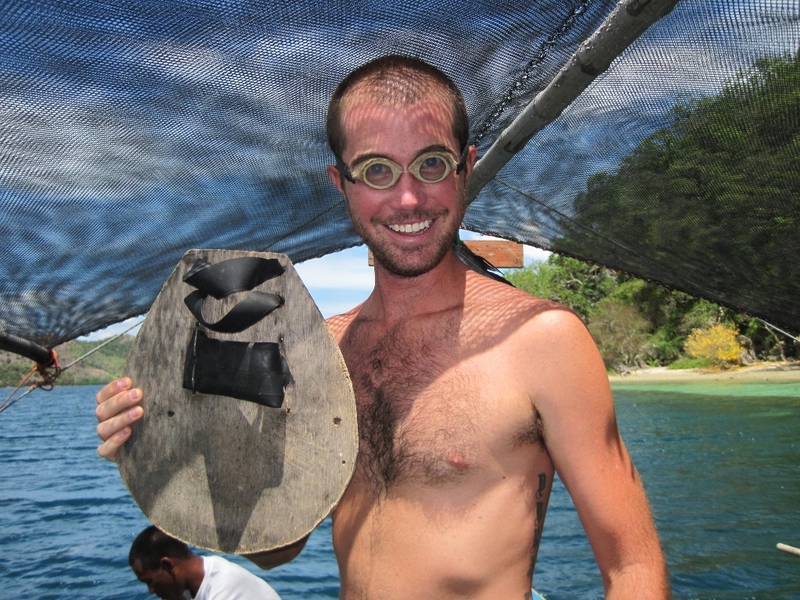 The handmade goggles were carved out of fish bone and held together by fishing line while one fin was made of fiberglass and the other from old wood scraps. 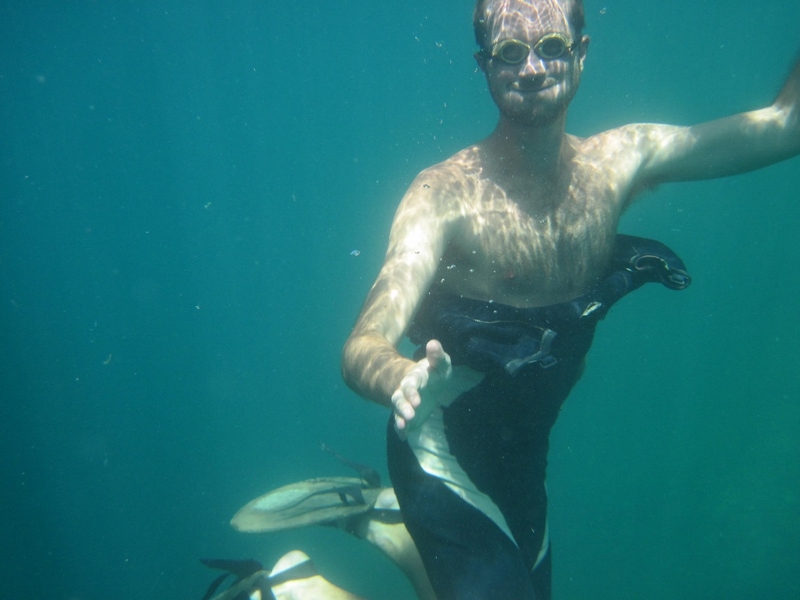 The goggles must have been a custom fit because they immediately filled with water when Chris swam with them. Although they were pretty heavy, the fins worked surprisingly well! 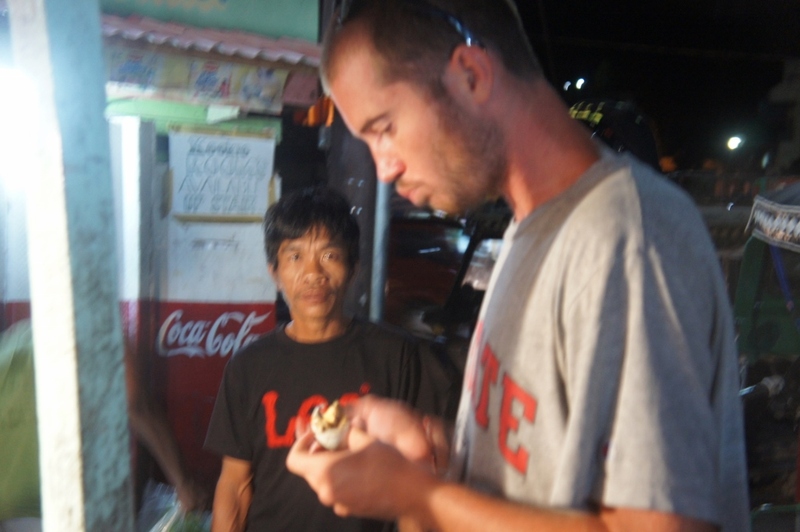 After dinner that evening, we walked around the public food market where we bought Chris a balut. 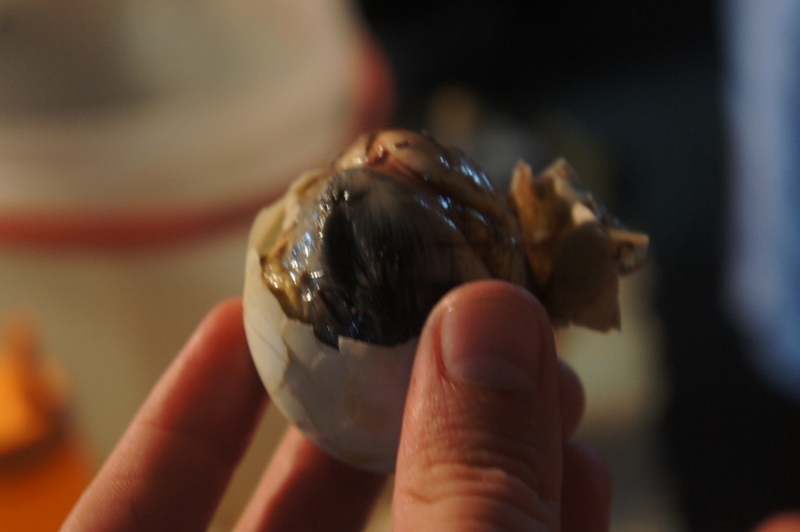 Often ranked among the top “nastiest foods in the world to eat,” balut is a developing duck embryo. 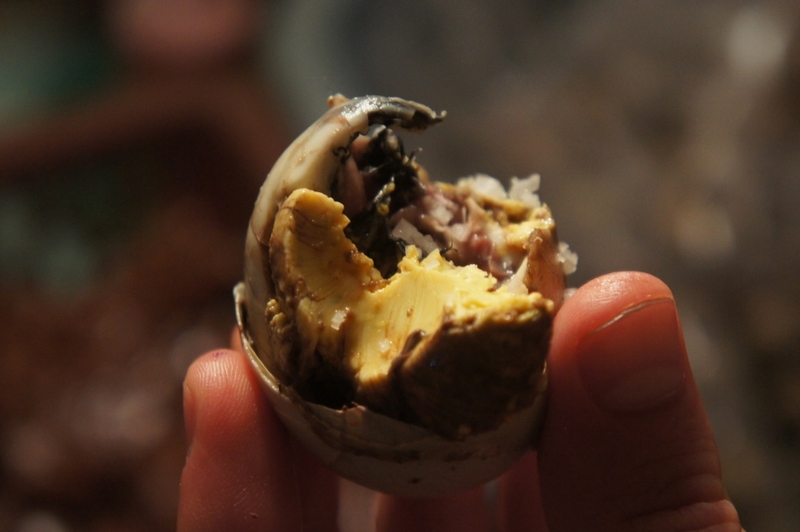 Filipino locals boil the egg and serve it to you in its shell. When we opened it up, I could barely look at it. Chris dug in and said the first bite tasted like a normal egg but that it had a bit of “structure” to it. The other bites weren’t as bad as the first, which we think included the head of the unborn baby duck. 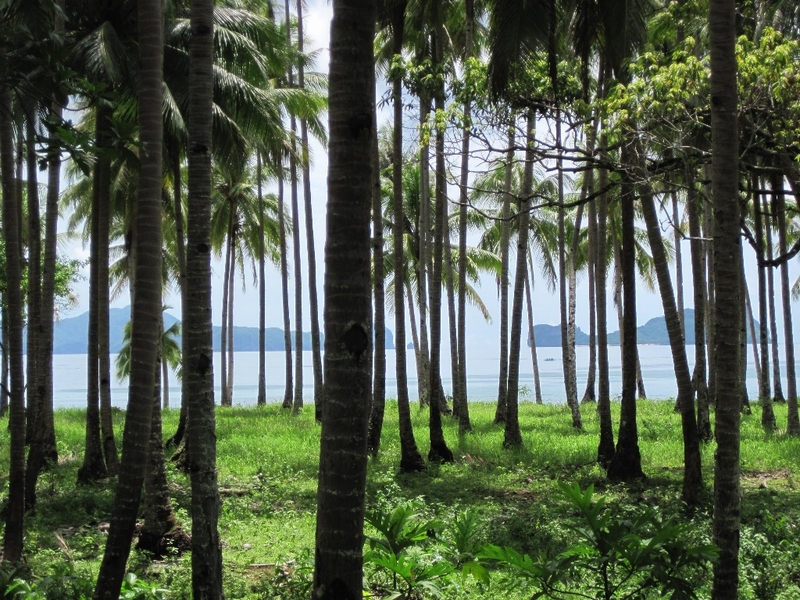 The next morning, we went on a chaotic island hopping trip that was jam packed with people and planned stops. 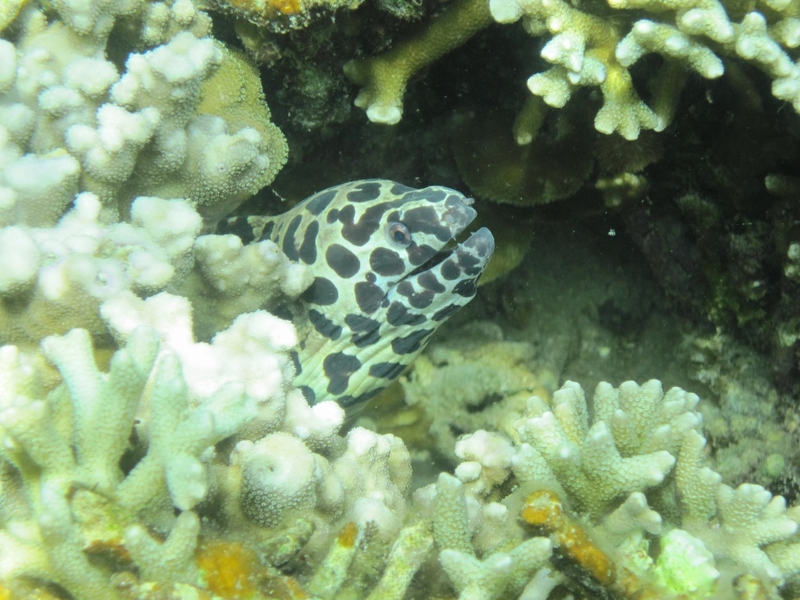 Our first stop was to a reef for some snorkeling…we weren’t expecting to see much but was pleasantly surprised to spot a few new things and even a spotted eel. 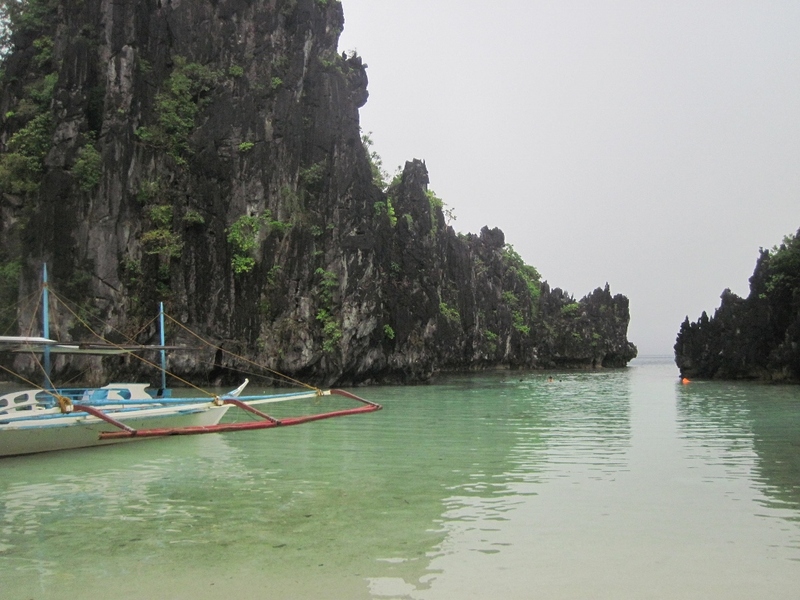 Our next two stops were to lakes set within the limestone formations. 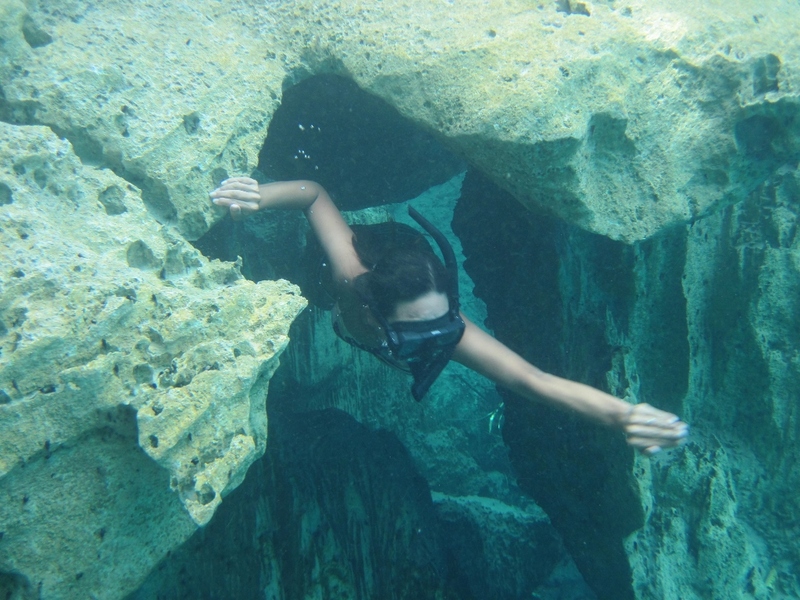 Both lakes were incredibly clean with good visibility and underwater rock outcroppings. 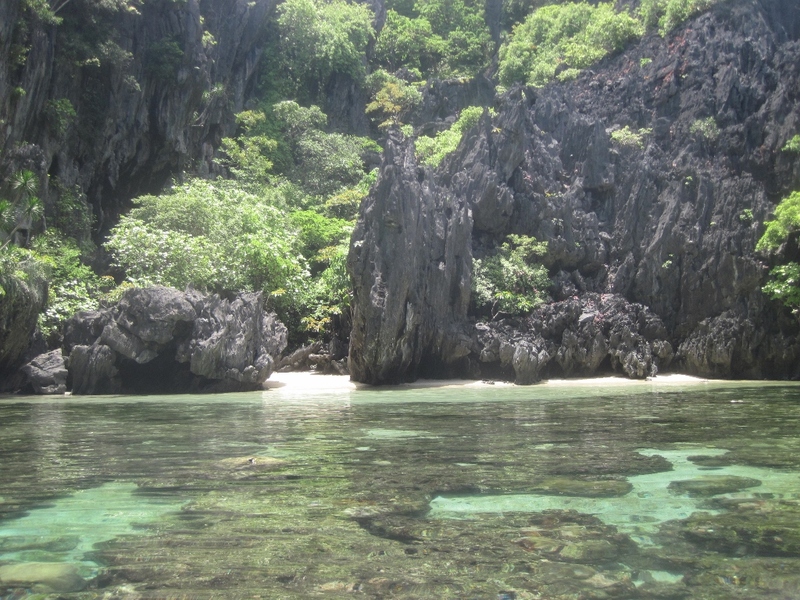 The remaining stops included another reef, a secluded beach and a shipwreck. 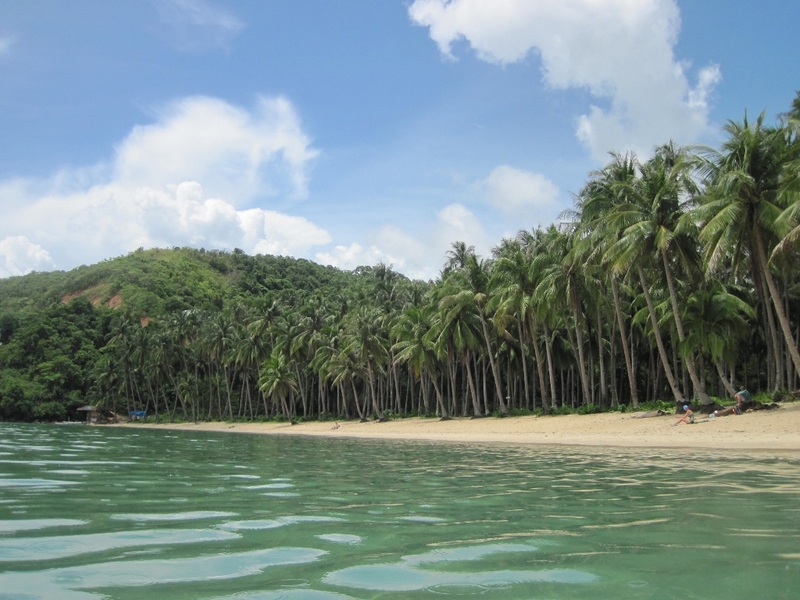 We spent nearly the entire day in the water and were thoroughly exhausted from the day’s activities. 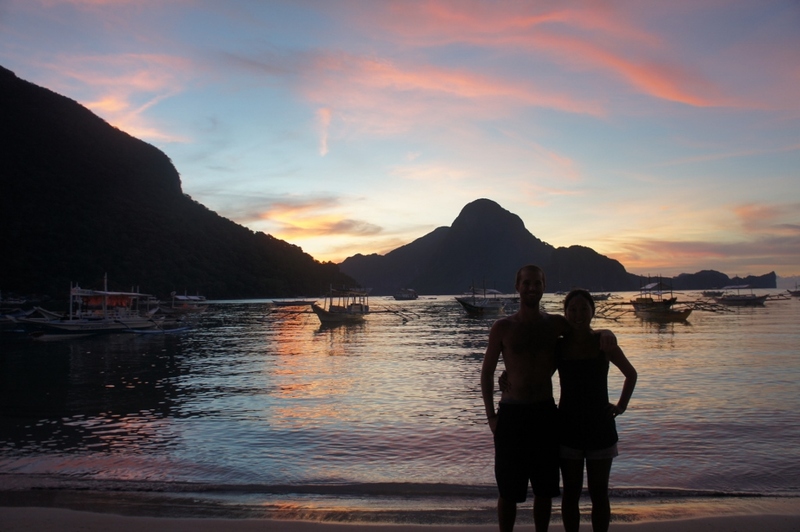 While we were enjoying one of Coron’s many amazing sunsets with a few people from our snorkel tour, we ran into an American girl, Kim, from our dive trip in Apo Island. 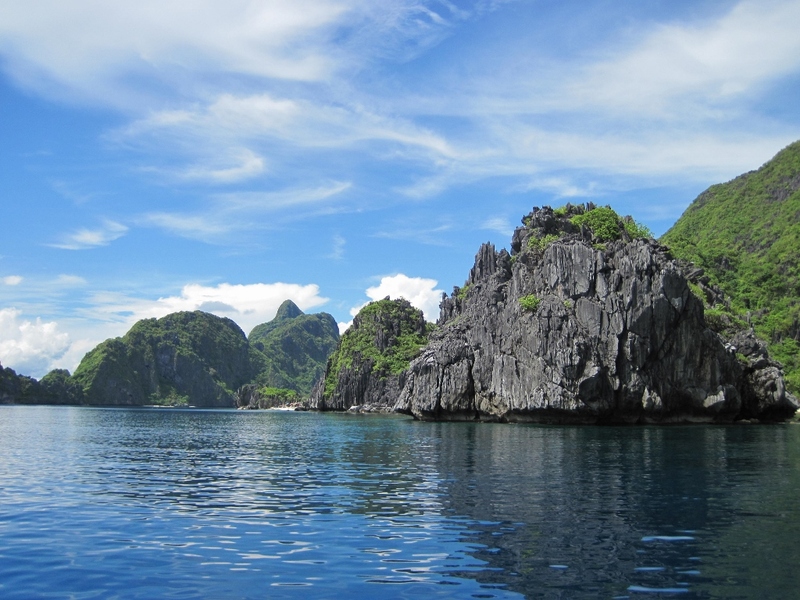 That evening, our group of seven (two other Americans, the Polish couple, and a Spaniard) made arrangements to hire a private boat to take us to some farther islands the next day. We met the next morning at the public market and split up to buy provisions for the day. 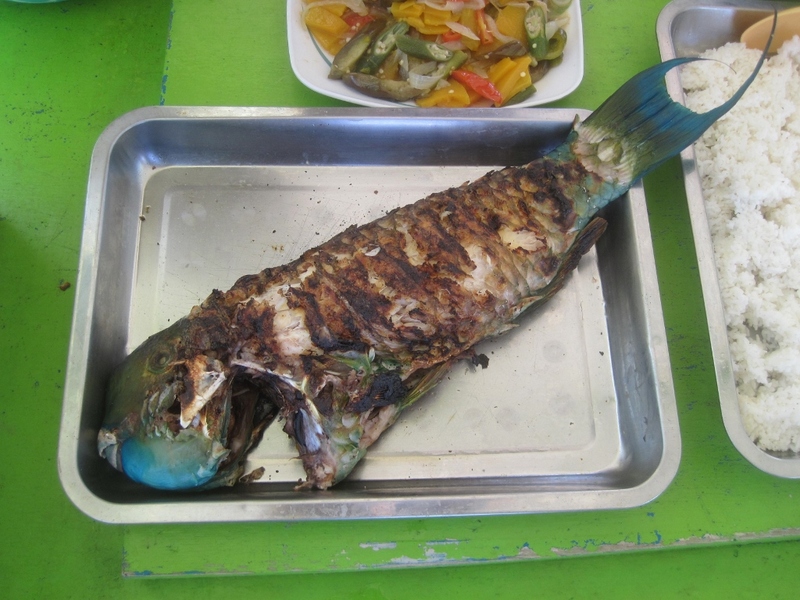 Chris and I were on fish detail and bought nearly nine pounds of fresh fish – a four pound parrotfish and two tunas. The others came back with fruit, vegetables, rice, beer, ice and charcoal. 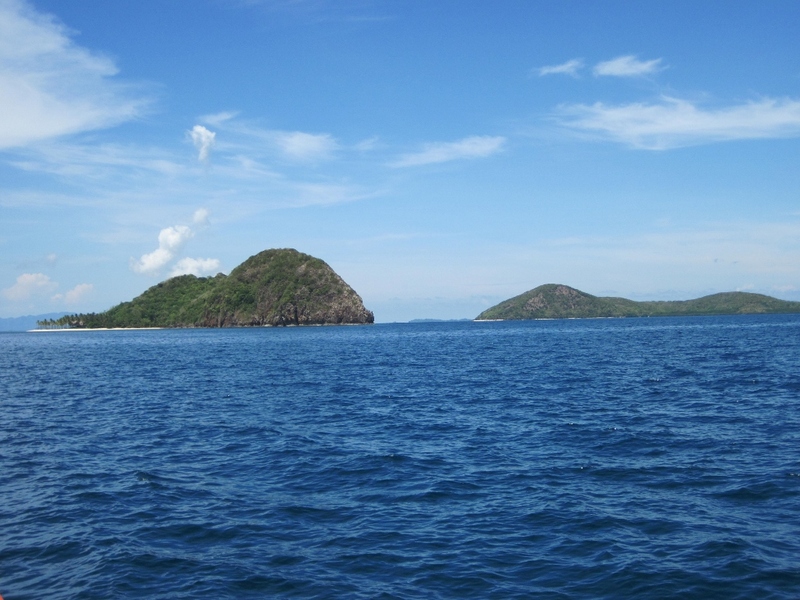 We loaded the boat and headed off to Malcapuya Island, our first stop for the day about 90 minutes away. About half way there, we came across a large fishing boat pulling in their tuna net. 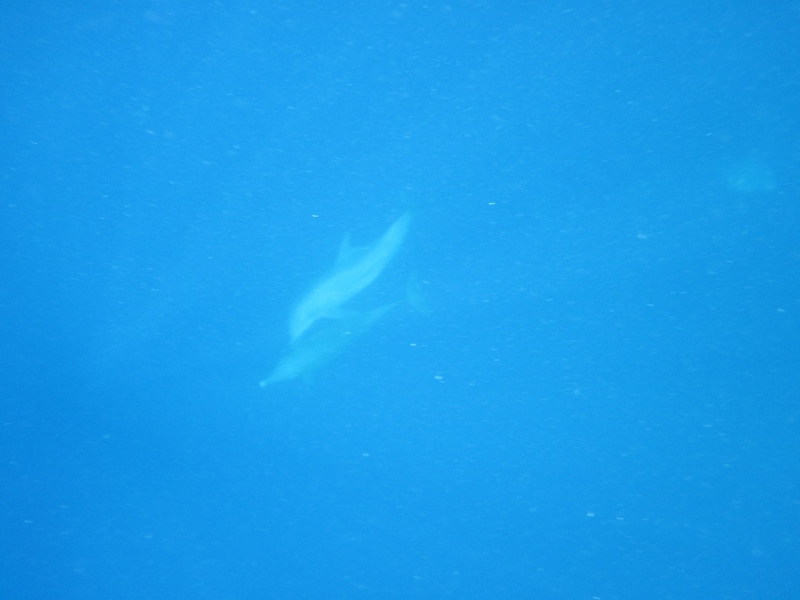 A huge pod of dolphins was swarming the boat so we asked the captain to stop, grabbed our snorkels and jumped in the water. 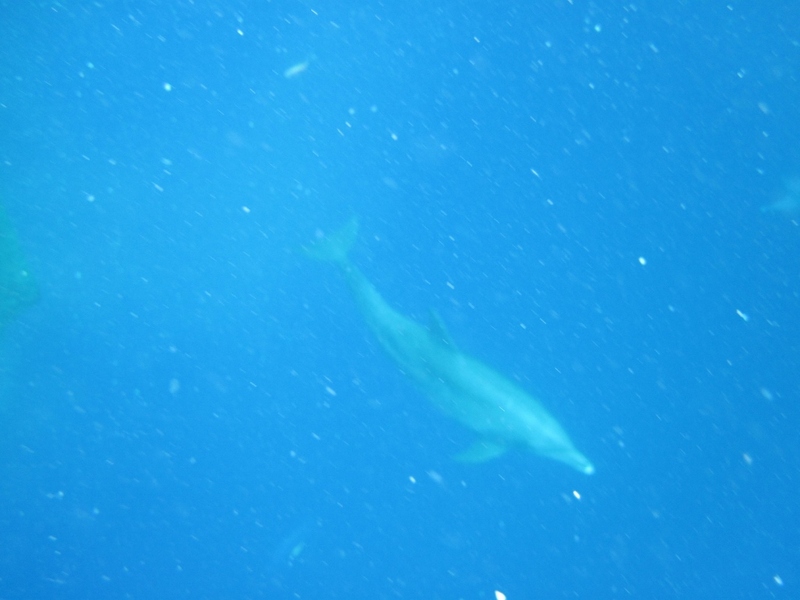 They were everywhere….swimming around us and jumping out of the water like crazy. The whole experience was awesome and totally unplanned. 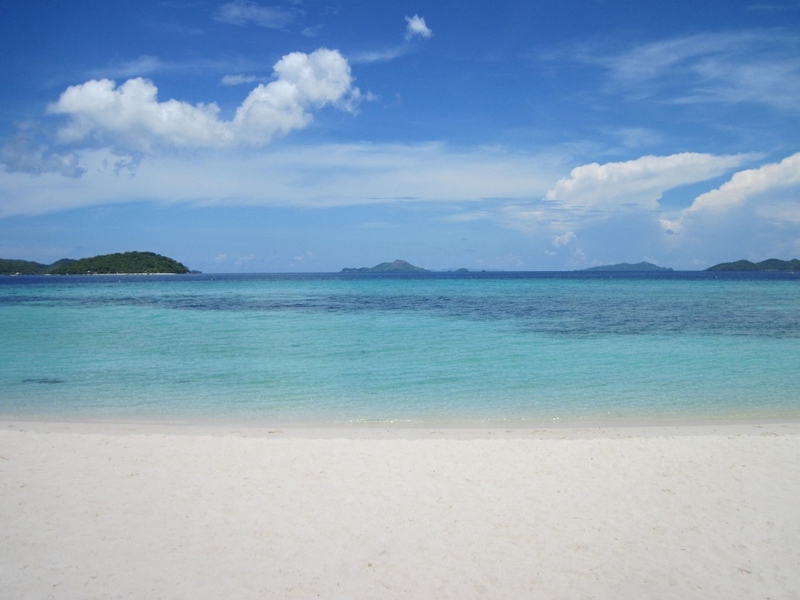 Malcapuya Island is known for its white sandy beaches and it did not disappoint. 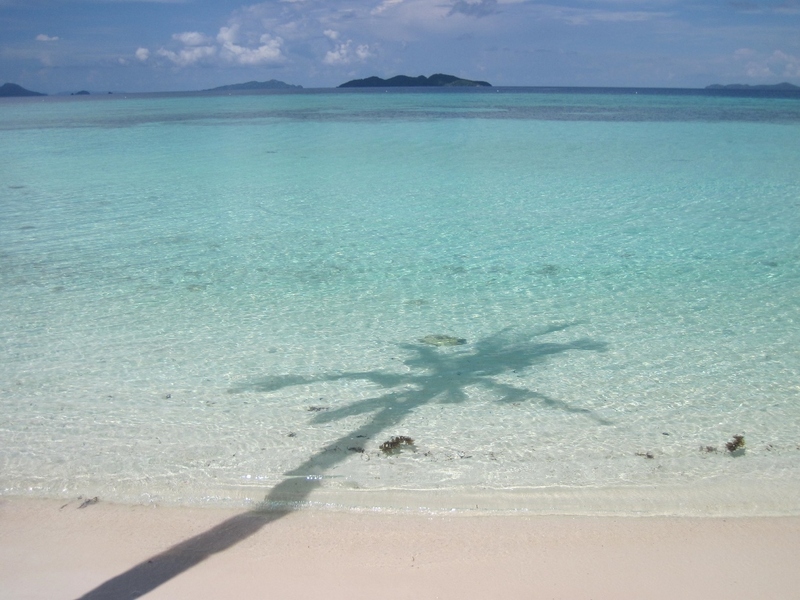 The white sand against the turquoise water was gorgeous…one of the most picturesque beaches we’ve seen. 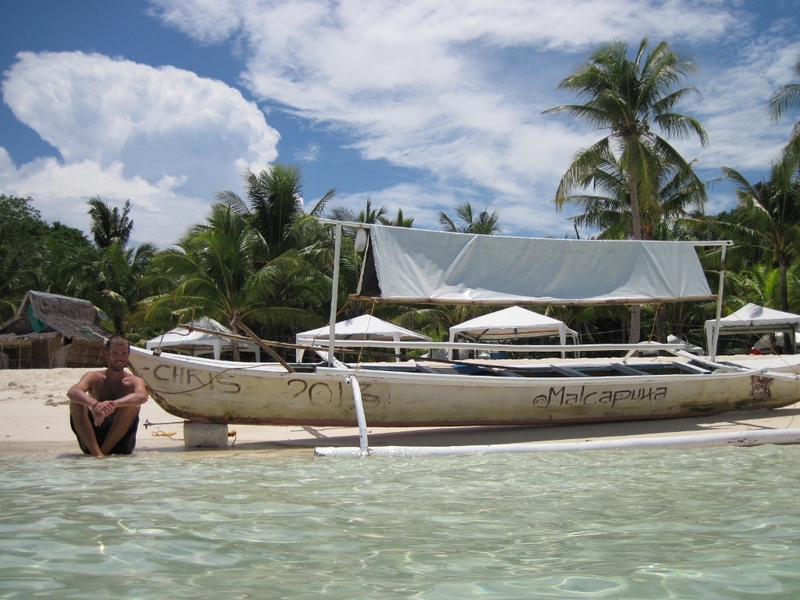 And what are the chances that a boat would be sitting on the sand that says “Chris 2013 Malcapuya” on it?! 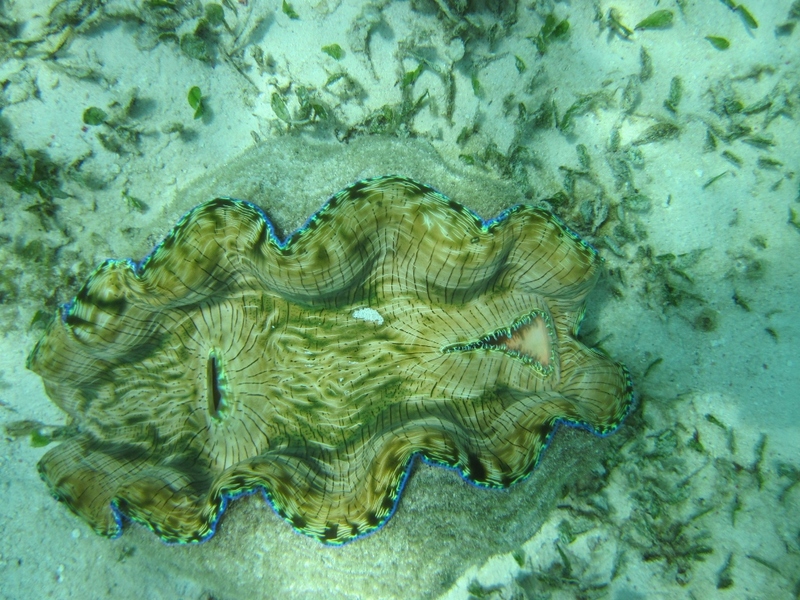 The island is also known for its giant clams located a couple hundred meters offshore. We swam for what seemed like forever until we reached them and they were huge! 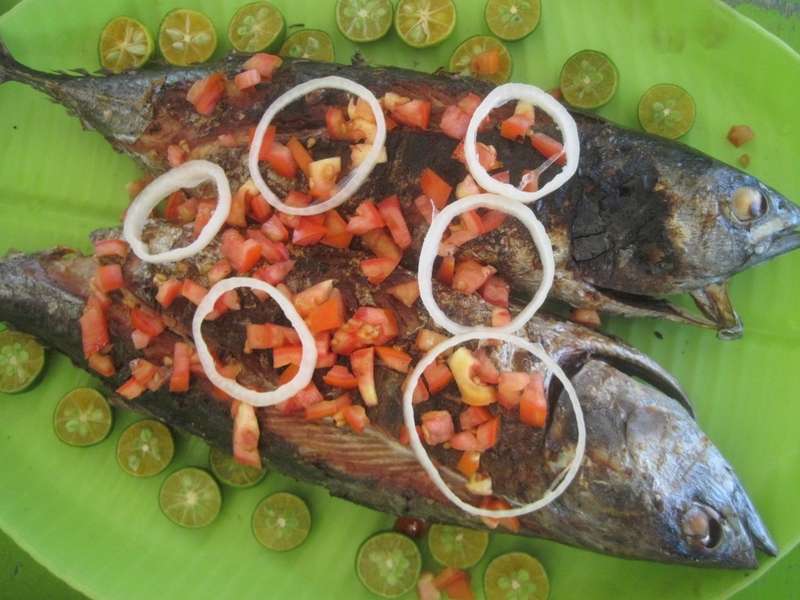 While we were swimming and snorkeling, the boat crew was busy preparing and cooking all of the food we had purchased. 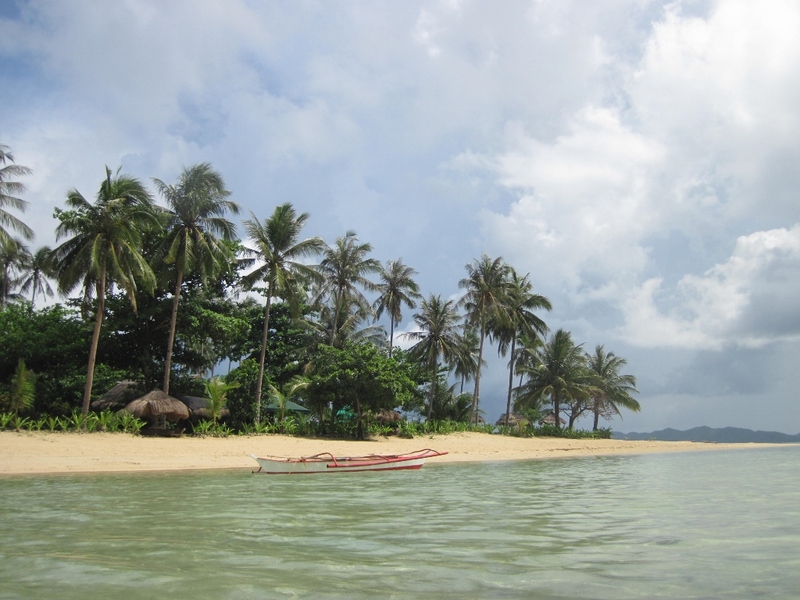 We climbed back onboard for fresh fish and ice cold beers and made our way to the next stop, Bulog Island. 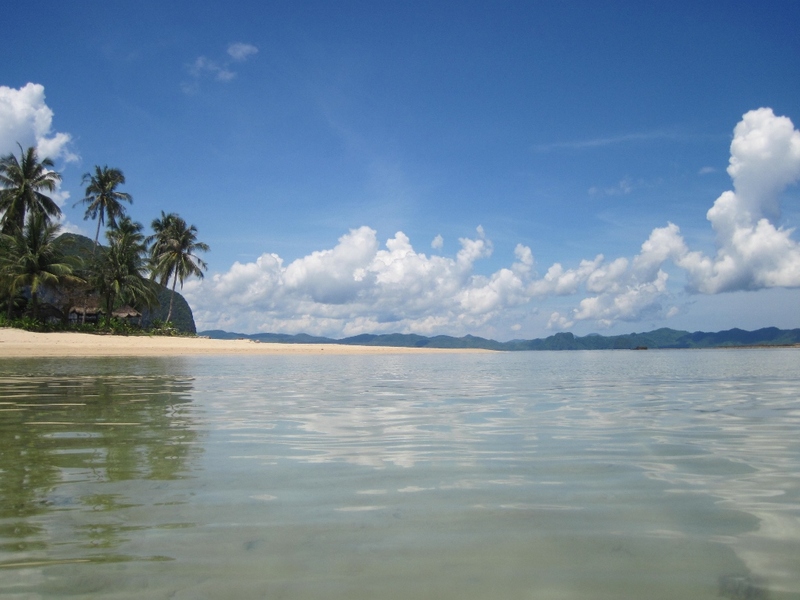 The beach wasn’t as nice as Malcapuya but the snorkeling was really good. 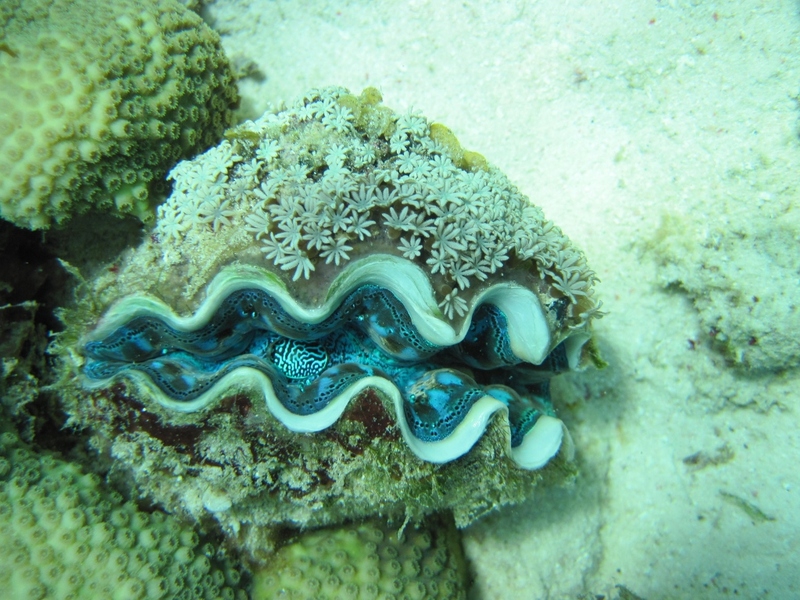 There weren’t giant clams but there were thousands of smaller clams embedded all over the coral. 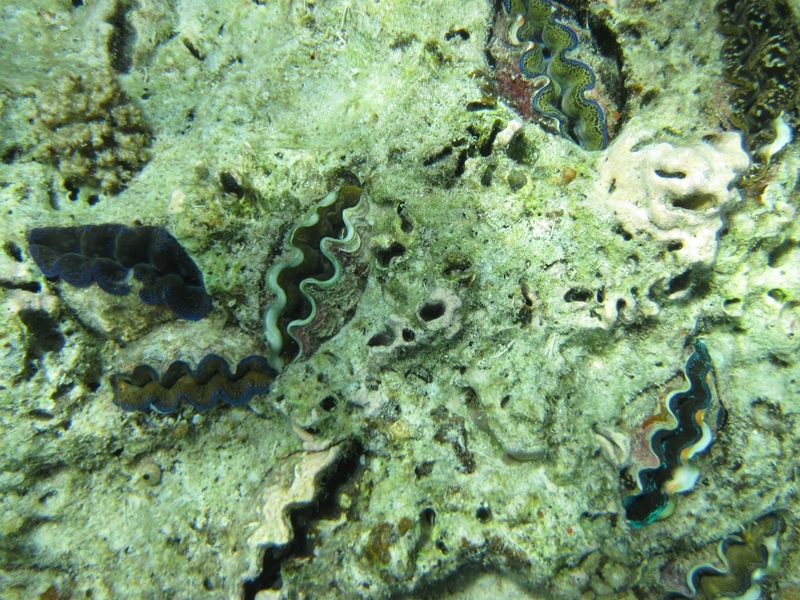 I’ve never seen so many clams. 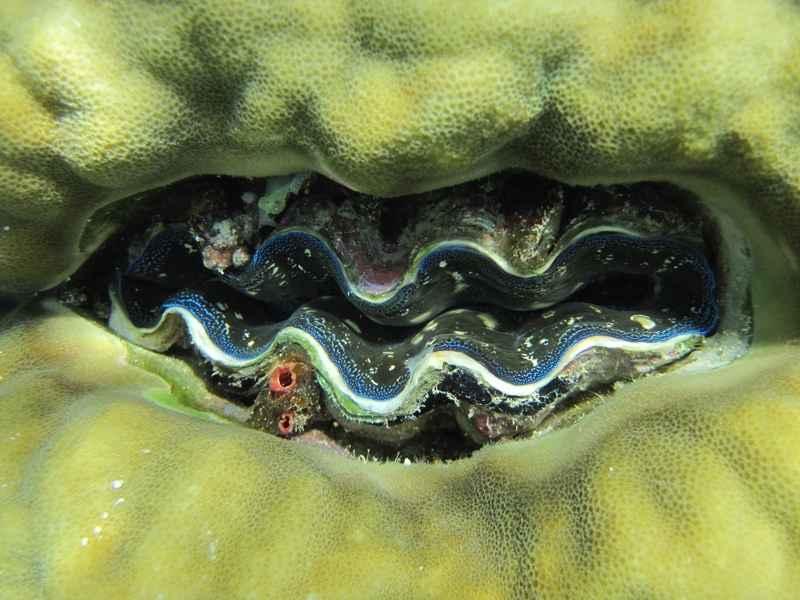 It looked as though the rocks had lips and some clams were so incredibly vibrant and colorful. The private boat turned out to be cheaper than if we had gone on an island hopping tour and we had more flexibility, could choose our own itinerary, had lunch cooked for us and had cold beer at our disposal! Such an amazing day spent with a great group of people. 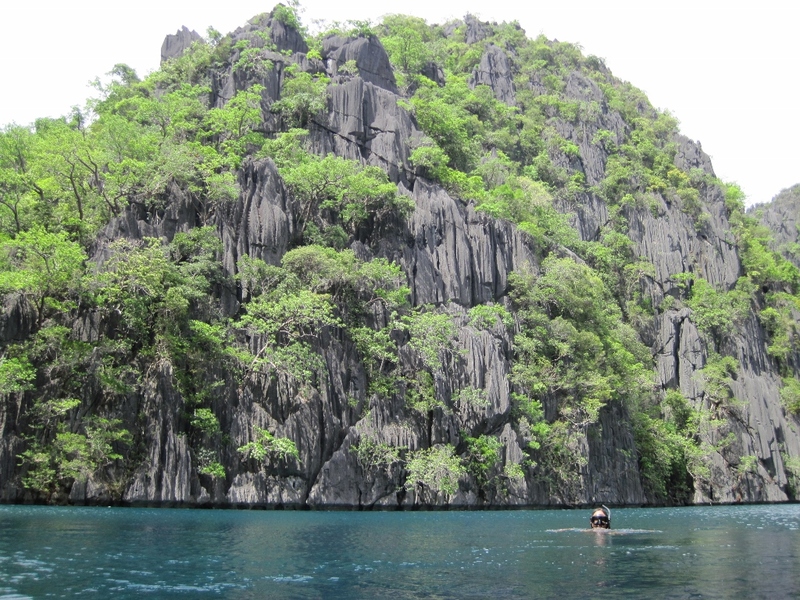 We had one more day in Coron and given where we were, I decided to sign up for two more wreck dives. Unfortunately, on our first pair of wreck dives Chris tried to equalize his ears a little too hard on our descent and busted a capillary which caused him to spit up some blood for the next few days. 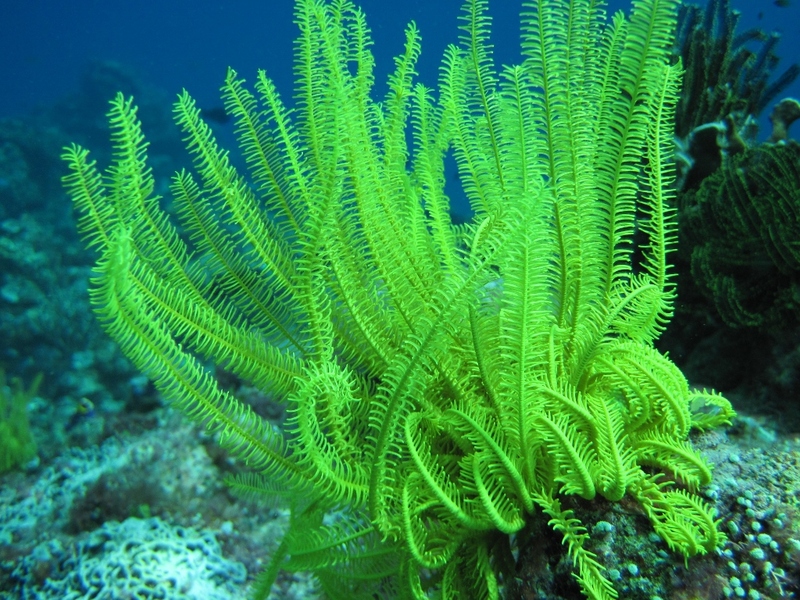 To be on the safe side and not to risk anything, he stayed home while I went diving with Kim from Oregon. I hate to say it, but these dives were by far the best dives I’ve ever done and don’t even compare to the wrecks we saw a few days before. These ships were a lot deeper (115 feet) and were a lot larger. You could easily get lost swimming around the bowels of the ship. One of the ships, Akitsushima, is the only warship in the area and you could still see its artillery and explosives. The other ship, Kogyo Maru, had a bulldozer, cement mixer, bombs and huge boiler rooms. Both were absolutely incredible but I was bummed I couldn’t share the experience with Chris. He would have loved it. That night, Kim, Chris and I went out for dinner and drinks with a few Germans from our dive boat. It wasn’t long before we found ourselves at a karaoke bar. Karaoke is a favorite Filipino pastime. They love it so much, you can easily find a place at 10AM to go karaoke. 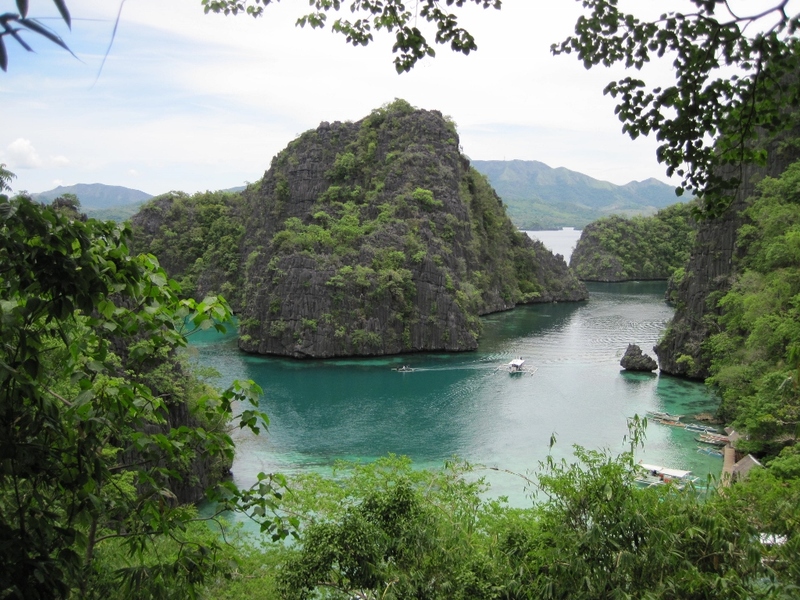 We (and by “we” I mean Chris and Kim) sang well into the night…a great way to end our time in Coron! 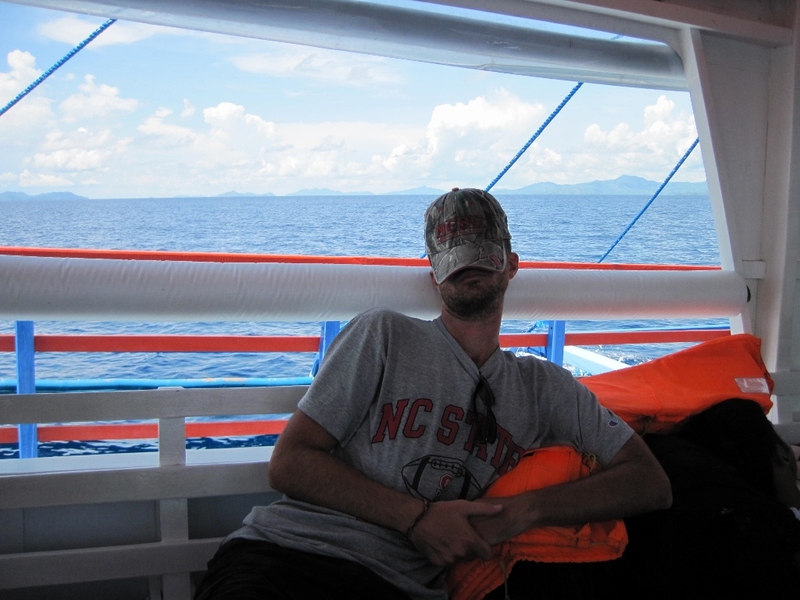 The next morning we boarded an all-day ferry to take us to Puerto Princesa. We arrived late at night and headed straight to our hotel to crash. Our hotel was located right next to a brand new mall so after three amazing weeks in the Philippines, we spent our last day shopping, eating and preparing for our last and final country…such a bittersweet feeling. The Philippines is the last country that Chris and I will travel alone because my mom and brother Dave are meeting us in Korea for the final leg of our trip! We’re so excited to see them and to explore the country and culture of my homeland! Dude, Chris! You eat everything! 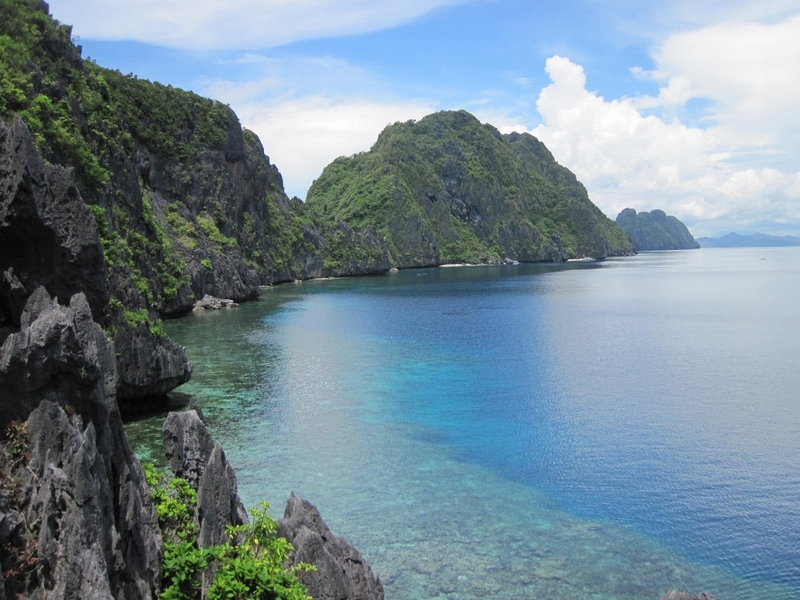 I really want to go to the Philippines now. This vegetarian was eating lunch while reading your post. Ewww to the baby duck in an egg!